On Monday (04 April) EGU President Tuija Pulkkinen and Vice-President Donald Bruce Dingwell will meet the Austrian Minister of Science and Research Dr. Beatrix Karl. For more information (in German) see the Ministry webpage. 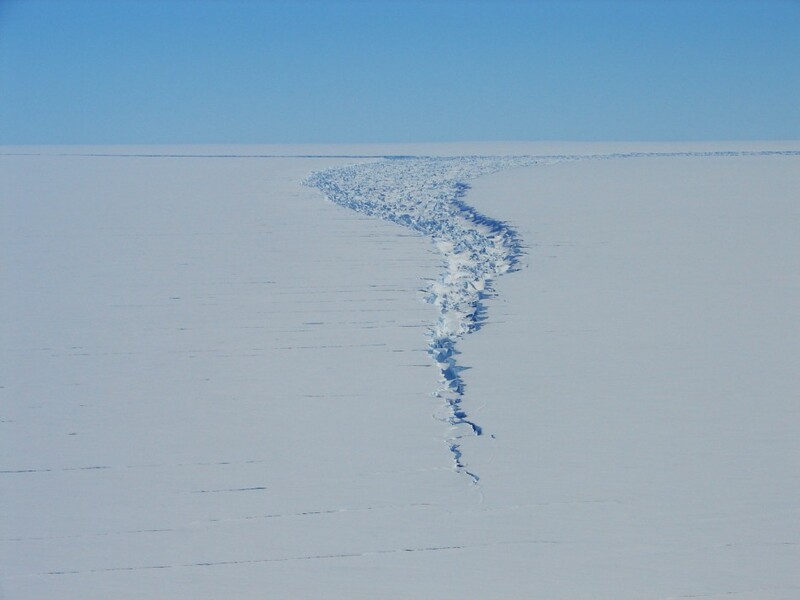 A helicopter view of the actively growing “Loose Tooth” rift system near the edge of the Amery Ice Shelf, East Antarctica; this branch of the rift was over 20 km long when the photo was taken on 31 December 2006. Photo Credit: James Behrens. Image submitted by John Orcutt, distributed by EGU under a Creative Commons Licence. Welcome, to the first full day of the European Geosciences Union General Assembly 2011. The meeting programme is available online, via the USB stick available at the ACV and via computer terminals around the General Assembly venue itself. All attendants are invited to this annual event where the past and future development of EGU is discussed. The Plenary is open to all EGU members and all EGU2011 General Assembly participants. The whole council will attend. This is the main meeting for bringing forward new ideas to the organization. Free lunch buffet (sandwiches & soft drinks) will be served. Our planet Earth is under increasing pressure. This union session will consider the broad geosciences aspects of those pressures, by combining presentations of past variability in combination with present observations/status and projections for the future of our Planet. It is planned to organize this EGU Session as a contribution to the ICSU (International Council for Science) meeting that will be held in 2012 in London. The past, present and future will be addressed by the three key-note speakers. This year on the EGU General Assembly blog there will be guest posts from participants about their research and their impressions of sessions. These are personal points of view not EGU corporate views. If you would like to contribute a research viewpoint, please email us. This viewpoint is from Catherine O’Riordan, Vice President of Physics Resources Center, American Institute of Physics, reflects on the use of news media programs (TV and Internet) to communicate Natural Hazard risk to the public. This work is presented as “Communicating Natural Hazard Risks to the Public through TV and Internet News Programs” in session NH9.3/EOS10 Natural Hazards Education, Communications and Science-Policy-Practice Interface on Monday TB4 (oral summaries of posters and discussion) and TB5 (poster authors in attendance). The scientific community has a real opportunity to reach the general public with messages about natural hazard risks by using media outlets. According to the U.S. National Science Foundation’s Science (NSF) and Engineering Indicators for 2010, the general public in the USA relies on local television news more than any other medium for their science and technology news and information — with the internet coming in as a fast-rising second. In response to the need to communicate accurate information about natural hazards and other scientific topics as well as the opportunity to reach a broad sector of the general public, the American Institute of Physics (AIP) has created two news products. The first one targets television audiences and is called Discoveries and Breakthroughs Inside Science (DBIS) . DBIS is a syndicated science news service that provides accurate and reliable scientific information in the form of twelve 90-second news segments distributed to local television stations throughout the USA and internationally each month. The newly launched second product targets internet audiences and is called Inside Science News Service (ISNS) . ISNS provides fully reported articles, graphics, and videos to provide major web news outlets and newspapers with accurate scientific reporting about natural hazards and other topics. NSF-sponsored research on DBIS revealed that there is a statistically significant difference in television viewers support for science in cities where DBIS segments are broadcasted compared to cities where they are not. 78% of focus group members reported that they liked watching news programs that featured science segments compared to a broadcast without them. AIP plans to continue to study ways to communicate natural hazards and other topics to the general public.